UPDATE 01/22/2012: I finished the afghan today. I will post it in show-and-tell. But since you all have helped me with this endeavor with the border, I wanted to share a photo of it here. I wound up using the "wee pony beads" in cream. It's a little hard to see, but it picks up a slight glimmer when the light hits the beads. THANK YOU ALL SO VERY MUCH FOR ALL OF YOUR HELP & SUPPORT! UPDATE 01/18/2012: I went to my LYS today. The nice gal there found some "Wee Pony Beads" in a cream color for me. (She knew of my dilemma, too.) In my opinion, they are a lot nicer than the regular size pony beads that I purchased. The hole's a little bigger than I'd like, but for now I'm working the border with them. So far it looks like this may do it. I'll let you all know how it turns out. Thank you all again!!! Well, I have searched high and low to figure out this myself, but... no luck. I'm hoping some of you may be able to help me. I am working on a special afghan for a friend of DH who just had breast cancer surgery. It's a lovely afghan with a beaded crochet border. The afghan calls for RHSS yarn but I am using comparable Bernat Super Value. The instructions call for you to use "6mm Pearls". 472 of 'em! The instructions also call for you to thread them on to the yarn, versus sewing them on afterwards. My afghan is done in "natural" and I wanted to add pretty light pink pearl beads in the border. I purchased the 6mm pearl beads as instructed, but they come on a tiny cord and have such a tiny hole that is is IMPOSSIBLE to thread on to yarn. I looked to see if there is a "boring" tool that I can purchase to make the hole bigger myself but I couldn't find anything. I even tried pony beads, but they just didn't look right at all for this project. Plus, the holes in them are just way too big. I looked for beads on-line (shops and eBay) but could find nothing that looked like the hole was a decent size. I tried the biggest seed bead I could find, but that hole is also too small. In an effort to make it work, I tried working the yarn through using two techniques (gluing the yarn end, and threading with a beading needle). No luck there. I considered sewing them on, but I've never done that and I'm currently quite intimidated at the prospect of doing it for almost 500 beads. Any ideas anyone? I appreciate any help you can give me. I would even work with a smaller bead (than the 6mm called for) if can can somehow work the yarn through the hole. P.S. Today I purchased 2 different bead reamers in hopes of gently opening the holes in my 6mm pearl beads but it's not working. DH tried using some things he has in his shop room but they all kept breaking. I also e-mailed the publisher for guidance. I measured the holes in my beads and they are about 1-1.5mm. Thank you for your help, and willingness to assist me. Take a length of dental floss, fold in half. Insert folded end through the bead. Thread the yarn through the loop of dental floss then pull floss back through the bead. It is worth a try. It might not work since it doubles the thickness of the yarn but maybe it will you have lots of strength! Thank you! I will try it when I get home & will let you know how it works for me. Put a bit of glue on the tip of the yarn, roll between your fingers so it becomes as thin as possible. Let dry. Thank you so much, Flia!... I tried that first because it's the way I like to thread beads, but it didn't work. The holes in these pearl beads are just so tiny, and I can't seem to find a company who makes them with bigger holes. I use nail polish on anything I have to bead. 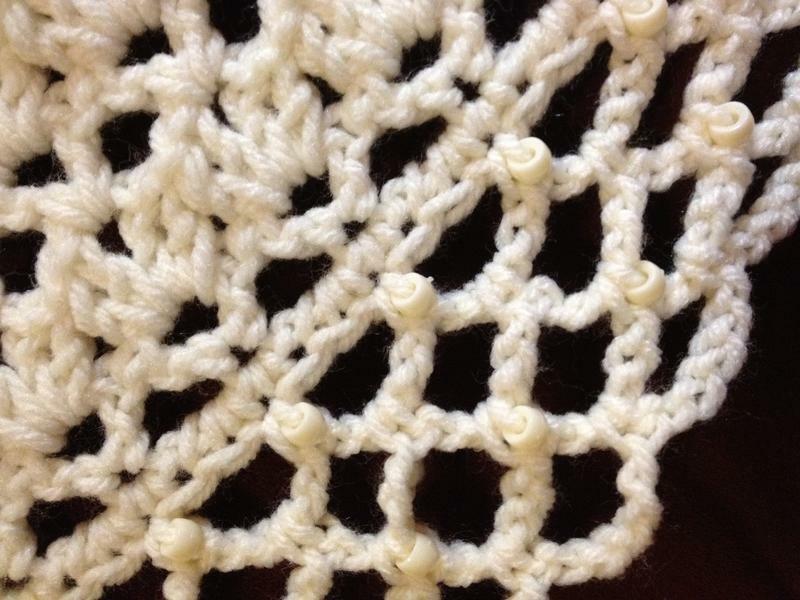 I'm not sure if this will work, but maybe you could string your beads on #10 crochet cotton (ecru or cream) and crochet this together with your regular yarn for the edge, sliding up the beads on the thread as you need them. The thread may show a bit, not sure if it will hide in the yarn's fibers, but it may work. Good luck, can't wait to see this when it's done! Thank you, dorothysgirls and mattenylou, for your ideas. I will try them both. SOMEthing has to work, right? Thank you ALL very much. I truly appreciate everyone's suggestions. I'm not aware of pearl beads having bigger holes but if I ever get a chance to run to Michaels this week I'll see what they have. I love ordering specialty beads from firemountaingems but in this case, you need to physically see that the hole is big enough. I have strung beads onto j & p crochet nylon which I would say is 4 weight to crochet a purse. The beads I used were the wood ones for macramé and I would suggest them to you but I know they won't look as nice. Right now I'm still trying to work with the pearl beads I have, while continuing to look and see if there are ones out there in the world with a bigger hole. I am willing to change bead styles, if I can find something with the right size hole that will look nice on this particular blanket. So thank you very much for your suggestion. the tool you would want to bore larger holes is called a reamer (here's a link to what I saw in my oriental trading company's catalog. also how I learned what they are called, lol) if you can't find beads with a better sized hole, that would be the tool to try and use. I'm afraid I have no bead-finding tips beyond what is already posted...JoAnn Fabrics here has a large bead section as well, I don't know if you have one by you, or if they carry beads. might be worth a look. Hi ~ Thanks so much for your suggestion! Last weekend I purchased 2 different reamers. If I work too fast, it crushes the beads. So I spent over 5 minutes gently working with one. I did get a bigger hole, but not big enough to attempt threading worsted weight yarn through. I need almost 500 of these beads, so I don't think this will work for me since I can't get one done in a reasonable amount of time. I figured that even if I *could* ream a bead to the right size in five minutes, I'm looking at around 40 hours of work just to ream all the beads I would need for the project. As for stores, I went too all of the most popular stores, except for Hobby Lobby. JoAnn's has a beautiful selection of beads. I did purchase some there in hopes that they'd work, but so far no luck. I really can't believe the difficulty of this step of the project. However, I can't wait to finish it, not only to give it to the special person it is being made for, but to share it with all of you who are trying so hard to help me. Walmart has pearl beads with somewhat larger holes. I've been trying to get myself to try incorporating beads into afghans and scarves. Maybe once I conquer symbol crochet, I'll give it a try. I've tried a reamer when beading with freshwater pearls, which have notoriously small holes, and not had a lot of success. But then, I have little patience with such things. I commend you for your perseverance! I really am so very appreciative of ALL of you sharing your ideas with me. Pony beads and the plastic craft beads in the same section will definitely work because the holes are plenty big. I'm sorry it took until now to post, but I was just able to get to Michaels today-much too busy . I checked out the 6/0 beads but wasn't sure, myself, as to if the holes would work for you, but I do use small 2mm onyx beads that no needle will fit through for my tiny mini crocheted bears and there is a special technique. I dug out some 6/0 beads that I have and was able to thread them through with a big hole beading needle and I always use disposable latex free gloves to jiggle the bead through. 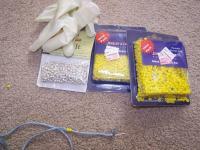 If you're interested in yellow beads, as you see below, I have more than enough for you and will mail them. They were dirt, cheap so I couldn't resist but grab them. The silver ones, you would have to try to find more but I was also able to thread one on. The 6/0 do not have standard holes so some tend to be bigger while others may not work. I have broken a number of beads and/or beading needles in doing my bear's eyes because of the difference in the holes. 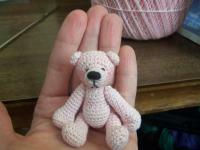 It takes some practice and here is a bear that I'm currently working on also below. #1Crochetfan ~ Your bear is OMGosh SOOOOO adorable! You are so talented! And thank you so very much for all of your help with my special project and your generous offer to send me your beads. I did try the regular pony beads and the holes were just too big. I also purchased some 6/0 beads, too, but the holes were just a bit too small. (This kinda sounds like "the three little pigs"story, doesn't it? Haha.) I just picked up some "wee pony beads" and worked them on to the border. Because of the limited color selection, I chose cream, which matches the yarn color. It wasn't quite the look I wanted, but I am pretty happy with the results. #1Crochetfan ~ Can you explain a little more how you got the 6/0 beads on the yarn? I'm not sure how you're using the latex gloves to work the beads on. The reason I am asking is because I have pretty pink 6/0 beads and I will redo my border if I can get the beads on Bernat WW yarn. I use a big eyed beading needle(I think it's size 10-13) in which both ends of the needle are sharp and the big eye is in the middle. I thread only a small amount through the needle and hold the glove around the middle to shimmy the bead through. You don't need the whole glove, necessarily, but enough to hold around the middle of the needle to give you the friction you need to get the bead through. I taught dd this appoach in doing her hemp bracelets when she uses beads with holes that are smaller than macrame ones. Thank you so much for sharing! I might need to make this afghan again and would like to use the smaller beads like you used (6/0), so I will use this technique. I just took some pictures of the finished afghan. As soon as I get them off my phone I will post them in show-and-tell. Oh, I bet it turned out beautiful. I can't wait to take a peek. Tcarra, Thanks for the infomation, good post!